The player is asked the 7 questions on the board. If they are incorrect or don't know, a tally is added next to the answer. If they get it right, they collect the tallies next to the question. Once they are finished answering questions, they get to erase one and replace it with their own question, so all of the questions are user generated. After each play, a picture is taken of the board to harvest the trivia questions. Goals: learn interesting information about the crowd at an event, have players learn something new, use OCR to convert real world data into digital data, and have fun! Cultural References: “What is the meaning of life” (42 of course! I like this question because the frequency of which it is answered says a lot about the crowd etc. (notice - opinion questions are allowed so long as they have a unique answer). Before starting, "seed" the board with an initial set of questions. Put tallymarks next to them based on your expectation of their difficulty (let’s say 4 tallies for hard, 3 tallies for medium, 2 tally for easy). The player answers all of the questions. If they skip a question or answer it incorrectly, add a tally to that question. If they get a question correct, they get the number of points equal to the number of tallies next to the question and those tallies are erased (to zero). So, hard questions stay on the board longer, collect more tallies, and if answered generate more points for the person who got them right. If they guess incorrectly, write their guess on the board so future players know that answer is wrong. You cannot use outside sources of information (cell phones, etc. ), but players can play in teams if they choose. Once a player is finished, add up their points and put them on the Top 10 leaderboard if they had enough points. If a question has exceeded 10 tallies, it is automatically erased. Also, the player must erase the question with the fewest number of tallies. If there are multiple questions tied for fewest tallies, they choose one. Now the player creates their own question to add to the board. It is often useful here to repeat the question rules (see above) and say “The goal is for questions to be fun and/or interesting”. That helps people not be so nervous about making a unique, super hard clever trivia question. Once they are done, add a single tally to any questions without any tallies (ie the ones the player just got right or just added to the board) and show the player the answers they missed (of course, tell them not to tell other people the answers!). And that’s the game! 1) A very clever social studies teacher from Ohio suggested that this game would be perfect for review periods in his class. Students not only have to answer questions, but they have to generate them. The Question Answerer Leader Board motivates them to do know the information, and the Question Asker Leader Board motivates them to stump their classmates. 2) It’s a good way to collect trivia questions! 3) It teaches people interesting facts, and forces them to codify the knowledge that they have for others. 4) We actually connected a camera to the front of the white board and took a picture after every participant. The goal is to collect the questions, and also to use character recognition software to make those questions searchable. This was an excuse to beta test OCR for another similar application, so we'll see how that works! I admit it - I am data obsessed. I want my data maximized around density, interestingness, and uptakability (yes, beware many made-up words in this post). That means more data, more easily absorbed, that’s more interesting. A crowd of people, especially those at a specific event, is an incredibly data-rich environment, and usually that data is not well documented. We do gather some data, though... for example the Google+ (I don’t do Facebook) pictures of people and their clothing tell us something about them (seen through our mind’s eye, which may not be the same as the clothes wearer or course). We have a list of participants’ names, perhaps also professions of those at the event which tells us something... and we have all the beautiful but poorly documented intuitive senses that we as human beings generate in our brains. But none of this data is not well organized or evaluated, rarely by the people putting on the event and even less frequently is that data/analysis made public. So my question for the Maker Faire was “How can we use a crowd to both generate data, generate motivation to create the data, and display the unique/interesting qualities of the crowd itself?” One mechanism to accomplish this would be a survey for Faire-goers with questions like “what political party are you affiliated with?”... “What is your favorite color”... etc. But the questions are seeding the type of data we receive, right? It may be the crowd feels that political party and color is irrelevant, but since we’re asking the question about political parties that is what they will respond to. Also, they have little motivation to answer our question - they get nothing from it and have no further interest in the result. Finally, we are displaying unique data about the crowd but it’s uniqueness is defined through the lens of our questions - that is, the crowd is not defining its own lens. Example questions: “Rounded to the nearest 1000 meters, what is the maximum depth of the Grand Canyon”... “Which came first, the chicken or the egg?”, What is Dale Grover’s favorite color?”, “What class of westerns is the movie “The Good, the Bad, and the Ugly” part of?”, “What is the meaning of life” (42 of course! I like this question because the frequency of which it is answered says a lot about the crowd etc. (notice - opinion questions are allowed so long as they have a unique answer). For the initial set of questions, put tallymarks next to them based on your expectation of their difficulty (let’s say 5 tallies for hard, 3 tallies for medium, 1 tally for easy). The player answers all of the questions. If they skip a question or answer it incorrectly, add a tally to that question. If they get a question correct, they get the number of points equal to the number of tallies next to the question and those tallies are erased (to zero). So, hard questions stay on the board longer, collect more tallies, and if answered generate more points for the person who got them right. The player must erase the question with the fewest number of tallies. If there are multiple questions tied for fewest tallies, they choose one. ALSO, any questions which exceeds 20 tallies are automatically erased (to get rid of impossible questions). Now the player creates their own question to add to the board. It is often useful here to repeat the question rules (see above) and say “The goal is for questions to be fun and/or interesting”. That helps people not be so nervous about making a unique, super hard clever trivia question. OPTIONAL: We didn’t do this at A2 maker faire but we should have - create another Top 5 list of people whose questions were answered with the greatest number of tallies (meaning, toughest ANSWERABLE questions - those which never get answered go away). This incentivizes people to make tough but good questions. A lot of interesting data is generated about the crowd - the best question answerers are identified, as well as the best question askers. The types of questions themselves give unique clues to the knowledge set of the crowd - mostly science questions?, trivia questions?... how creative/unique are they, etc.? Also, it’s a great mechanism for build a big set of trivia questions since you’re crowd sourcing their generation. 1) The seed questions (initial questions) REALLY impact the game. 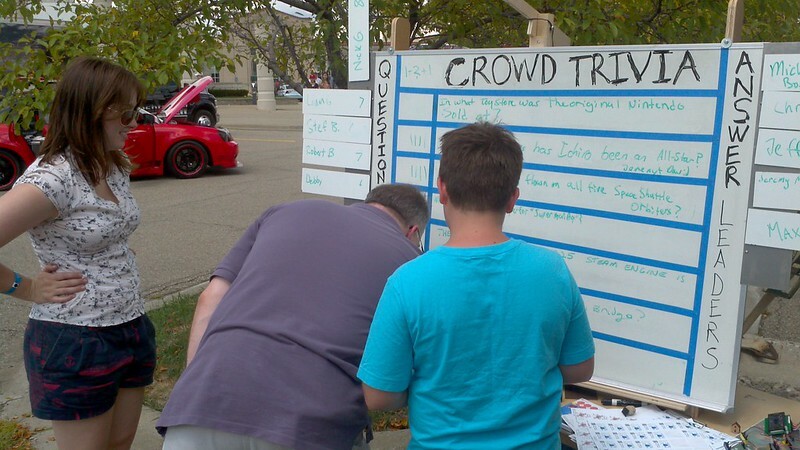 At A2 Maker Faire we seeded the board with mostly traditional trivia questions, plus one single opinion question “which can first, the chicken or the egg?”. As a result, most people created trivia questions. Even though the rules clearly allowed for opinion questions, most people did not create them. I think that was in large part because the board seeding was biased towards trivia questions. 2) I like that the questions on the board get tougher and tougher (because the easiest ones go away), but it can mean that people who walk up to the board and realize they don’t know any answers immediately decide not to play. To address this I used the hook of “don’t worry - nothing bad happens if you get them wrong!” and “If you get them wrong, you’re just helping other people!” which worked ok, but I don’t think that’s a real effective solution. 1) PEOPLE WANT ANSWERS AND THEY DESERVE THEM: Initially we didn’t share the answers with people, because we were afraid people would cheat and tell others. That was dumb... If you miss every question (which many people did and I would have many times if I had played) you should at least get the satisfaction of learning the answers. Plus, no one cheats when they have no good reason to, and no one cheated the whole time. 2) OPEN ENDED QUESTIONS TAKE SOME PEOPLE A REALLY LONG TIME TO ANSWER: Some people were really intimidated by having to come up with a question. I think they felt that it had to be clever, important, good, and they would be judged on its quality. Some people literally took 10 minutes to come up with the question. On the other side, some people were unwilling to guess the answers, even when guessing had no negative consequence! This is very unusual... given the option of ensuring failure or a 1 in a million chance, wouldn’t you choose 1 in a million? I would, but many people refused to. I think that some people feel more negative impact on their ego by engaging and failing (guessing) than not engaging at all (skipping the question). I hope it wasn't too obscure. Your board and quiz generated some fun discussion on the drive home, and was inspiring to a socially inquisitive 13 yr old. Thanks, we enjoyed your efforts, and yes, your insistence that we give it a try. You know, I'm not sure but I think it got quickly erased! That's the harsh reality of Crowd Trivia, but I actually really like that type of implied "cultural knowledge" type question, it's interesting. If you use it or play it in the future, let me know, I'd love to hear your version and how it went.